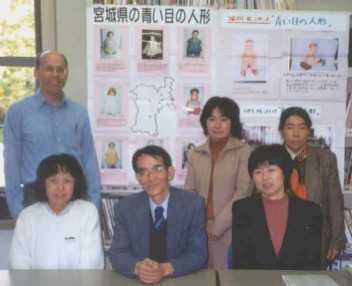 The Miyagi Blue-eyed Doll Study Group promotes educational activities and performs research related to the Blue-eyed Dolls sent to Japan from America in 1927. The group has about 30 members, and about 10 members attend the monthly meetings. Many members are current or retired teachers, and several members belong to the Miyagi Co-op, which provides active support to the Study Group. 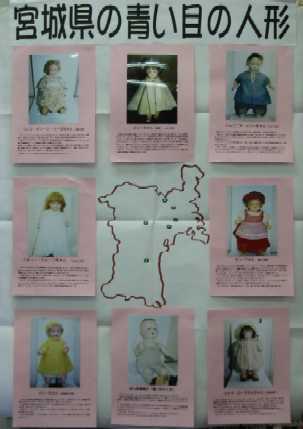 In February 1999, several members of the group created a web page on the six Blue-eyed Dolls in Miyagi Prefecture that had been found up to that time. 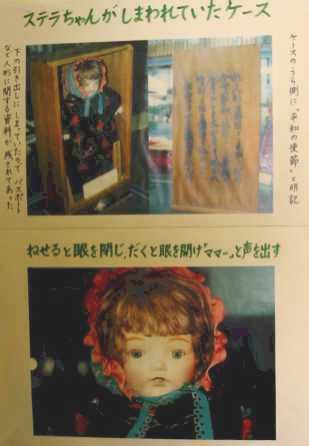 Through the efforts of the Miyagi Blue-eyed Doll Study Group, eight dolls have now been found in Miyagi Prefecture, which received a total of 221 dolls from America in 1927. The Miyagi Blue-eyed Doll Study Group has prepared many materials for educational activities in schools in Miyagi Prefecture. The group has researched the history of each of the eight dolls in Miyagi, and the members have put together posters and photos that can be used in presentations to students. This fall the group coordinated a special three-month exhibition at Sendai Historical Museum of seven of the eight dolls in Miyagi Prefecture. I never realized that a group such as the Miyagi Blue-eyed Doll Study Group existed until I received an e-mail in October, one month before my planned visits to three schools in Miyagi Prefecture. Ms. Toshiko Saito, who had retired in March 2001 after teaching for many years at Hirobuchi Elementary School, found out that I would be visiting the school on November 13 to talk about the Friendship Dolls and about America. She told the other members of the Study Group about my planned visit, so Ms. Tomoko Shizukuishi, another member of the group, contacted me by e-mail and kindly offered to coordinate my visit to the different schools in Miyagi. She also arranged for me to visit two other elementary schools and to meet with the members of the group at a special meeting at the Sendai Historical Museum. Ms. Shizukuishi accompanied me to each of the five schools I visited in Miyagi, and Ms. Saito also went with me to the three schools I visited on November 13. In addition, Mr. Shuji Sato of the Miyagi Co-op Cultural Activities Office kindly drove me to the two schools I visited on November 12. In the evening on November 13, three members of the Study Group treated me to dinner at a gourmet tofu restaurant. I did not know quite what to expect at a tofu restaurant, since I had never been to one before. The meal consisted of about 15 different tofu dishes brought out by the waitress one or two at a time. I never realized tofu could be cooked in so many ways, with the tofu in the separate dishes having different consistency and color. The food was quite delicious! Before the November 14th meeting of the Miyagi Blue-eyed Doll Group, I met with the Director of the Sendai Historical Museum and a member of the staff, who took me on a tour of the museum. That morning the museum was filled with elementary school children viewing the various exhibits and busily taking notes for school projects. One very interesting exhibit was a sugoroku (Japanese variety of Parcheesi) game board, which was made during World War II and which showed various drawings of wartime scenes and objects. During the Study Group meeting I talked about the experiences during my visits to the five Miyagi schools in the previous two days. We also exchanged some photos and historical newspaper articles related to the Friendship Dolls. The group members discussed the possibility of a homecoming to Japan for Miss Miyagi, the Japanese Friendship Doll sent to America in 1927, but they realized that raising the necessary funds would be a challenge. I talked a little bit about my web site on Friendship Dolls and how I hoped it could be a source where teachers and others could learn about the dolls exchanged between America and Japan for the purpose of friendship and peace.